Magpie is another one from our this-review-is-overdue list. Magpie is the sibling of one of our favorites, Hope + Olive. You get the same rustic charm of an interior as it’s fancier counterpart, but casual. If Hope + Olive is the formal dining room, Magpie is the counter-top bar where you hang out in the kitchen. They bill themselves as a pizzeria, and their pie is definitely excellent, but they’re a lot more. orange-twisted spicy Mezcal with little Rickey on the right. The bartenders at Magpie are as inventive and knowledgeable as anyone. I’m a bit of a lightweight and I especially love the mocktails they come up with when I don’t feel like getting a buzz with my pizza. Our last visit I had a delicious Tamarind Lime Spritzer, a virgin Rickey I think I’ll call it. It was just sweet enough and was able to highlight its tart and tamarind goodness. Molly had a smokey, spicy Mezcal cocktail with as much kick as our favorite margarita in the area, Mission Cantina‘s Tres Alarms. Cold Soup. Why isn’t this everywhere? 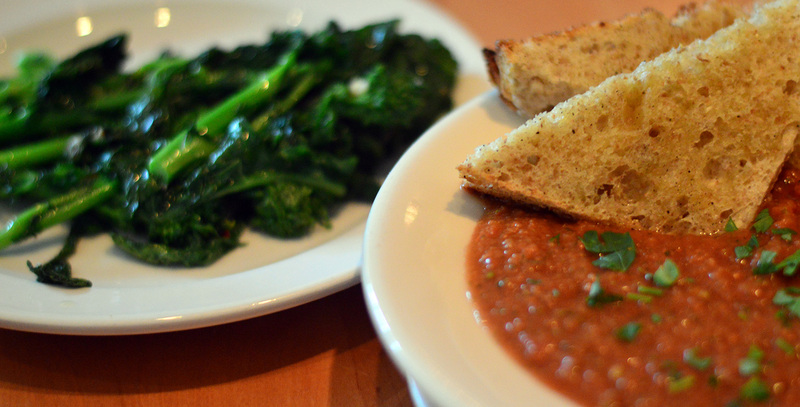 I started with their Gazpacho because I’m a sucker for cold soup and am totally annoyed more restaurants in the area don’t make it. The toast was garlicky perfection with the very traditional warm-weather staple. The portion was a little big, but I enjoyed every last drop. Sometimes we think they’re too generous. One of our first visits we ordered 4 “Starters” with our pizza and had to take most of the pizza home with us. Our last visit, if you count my Gazpacho, we had 3 starters and again took home half a pizza. That’s not a complaint because the prices are incredibly reasonable, but we want this place to stick around for a long time. With some of their Starters I’m not sure I could even buy the ingredients for the cost of ordering something like their delicious Crispy Eggplant. Magpie’s crust is where it’s at. It’s thin with plenty of crisp and glutenous springiness in play. Their toppings range from more traditional to ultra creative, so Molly and I don’t have a shared favorite. 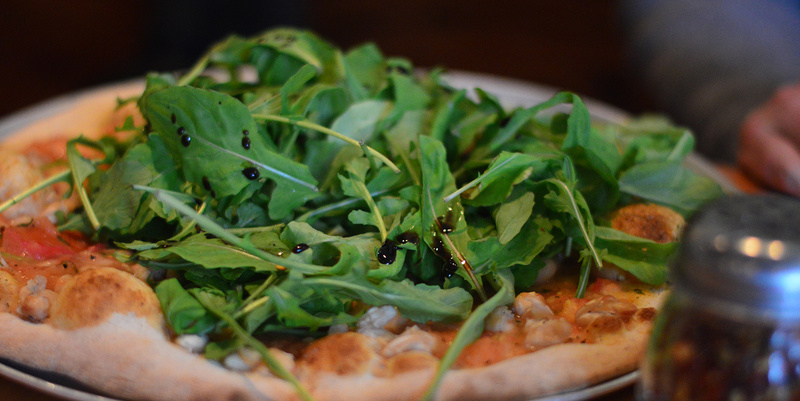 Our last visit I won the pizza-choosing contest and we got Pizza Fagiloi with white beans, aged balsamic, arugula, and chopped tomato. I think this is my go-to for the foreseeable future, but Molly says she prefers the Pepperoni and Mushroom (with its caramelized onion under-layer). It says a lot about their crust that it can perfectly serve as a vehicle for something heavy or light. Magpie also does desserts right. It’s rare that we order them because we’re stuffed after dinner, but the occasions we have indulged (post indulgence) we haven’t been disappointed. It’s also worth mentioning they have ample entrees, regular specials, and outdoor seating that’s fun for people watching, a long bar facing the life going by on the street.